Notre Dame is cursed. Last year, defensive injuries derailed a promising start to the season. This year it is the offense. Starting quarterback Malik Zaire fractured his ankle in Notre Dame’s 34–27 victory over Virginia, joining running back Tarean Folston, (who was lost last week) on the won’t-play-again-this-season list. On a brighter side, the week 2 odds that were posted on Friday did fairly well. On the highlighted picks – we were perfect SU and 68% ATS – overall, we were 89% SU and 63% ATS – just good enough to not be addicted and still better than anywhere else. Two wins to start the 2015 season has pushed Ohio State’s nation’s best winning streak to 15 straight. Up next are TCU (10), Memphis (nine), Western Kentucky (seven), Michigan State (six) and Navy (five). The “honor” of the longest losing streak had belonged to Georgia State, which had lost 12 in a row until Saturday night’s 34-32 win over New Mexico State. The win also marked GSU’s first-ever win over an FBS-level team as an FBS team themselves. Additionally, Colorado ended its 10-game losing streak, the longest amongst Power Five teams, with a 48-14 win over UMass. With those outcomes, UNLV now owns the nation’s longest losing streak at eight straight. Notre Dame, UCLA and USC are the only teams that have never played a non-FBS/Div. 1-A school since the current setup was established in 1978. Following the 2016 season, and because of a conference mandate, Big Ten teams will no longer be permitted to schedule games against FCS programs. V’Angelo Bentley is the only player in Illinois history to record a kickoff return, punt return, interception return and fumble return for touchdown in his career. Harold “Red” Grange is the only other Illini player with kickoff, punt and interception returns for TDs, but he never returned a fumble for a score. Remember this post from March? When we told you that “It’s hard to watch your heroes fall and attempt to hang on to long. Age always wins“. 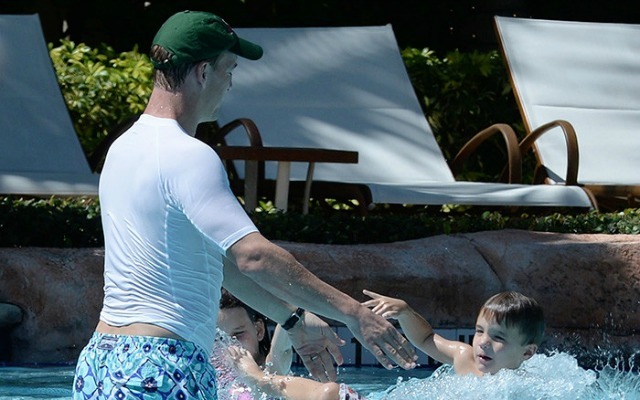 Well it seems wearing a swim-shirt was the fore-shadowing we needed on the final season of the Great Peyton Manning. No touchdowns during the pre-season and none yesterday against Baltimore. It was the 20th NFL season opener in which both starting QBs were coming off a season of at least 25 touchdown passes. It was the first of those games in which neither threw a TD pass. (Note: Tony Romo vs. Eli Manning on Sunday night was the 21st such meeting.) For Baltimore, the rest of the season seems to be a more difficult one as they lose Suggs with a torn achilles. But the issue is still Denver winning with a punchless offense – maybe someone should set Peyton up with DirecTV, because this cable-version of Peyton is hard to watch. The last time Marcus and Jameis met on the field was in January, at the Rose Bowl – and the results were the same then as they were yesterday. It was the first-ever opening-day matchup of rookie quarterbacks chosen first and second in the NFL Draft. But by halftime, it was all about Marcus Mariota, with number-one pick Jameis Winston earning only an interesting footnote, albeit an unwanted one. Marcus was 13-16 with 4 touchdown passes – the only other player to do that in their first game was Fran Tarkenton – except Marcus threw 4 in the first half! The Titans scored 35 points by halftime of their 42-14 win. Last year they NEVER scored more than 28 points in a game while going 2-14. As for Jameis, he is has played 28 games in college and the pro’s, going 26-2 – his two losses are both to Mariota. Sure, it’s only one game but seeing Mariota finish his first professional game with a perfect passer-rating that puts him ahead of Tom Brady (2nd) and Aaron Rodgers (3rd) gives the Titans hope that they chose correctly. As for Winston’s role in this historic matchup, his first pass was intercepted by Coty Sensabaugh, who returned it 26 yards for a touchdown. Over the last 30 years, only two other players threw a pick-6 on the first pass of their NFL career: Jay Schroeder in 1985 and, believe it or not, Brett Favre in 1991. It was not all bad for Jameis, he did finish ahead of Luck, Manning and Flacco in passer-rating Sunday. James Jones (two TD grabs Sunday) being back in Green Bay might be a lot more important to the Packers’ Super Bowl chances than we all thought. The Packers defeated the Bears, 31-23, at Soldier Field in the 11th regular-season meeting of Aaron Rodgers and Jay Cutler as starting quarterbacks. With that victory, Rodgers improved his record against Cutler to 10-1, with his only loss coming five seasons ago at Chicago – Cutler has now thrown at least 1 INT in every game against the Packers. The last QB to win at least 10 of his first 11 starts against another quarterback was Terry Bradshaw against Brian Sipe (1976-81). In Rodgers’ last three games against the Bears he has completed 74 percent of his passes for 806 yards with 13 touchdowns and no interceptions. He is the first player to throw 13 TDs over three games against one opponent since Dan Marino did it against the Jets (1985-86). No other player has ever thrown 13 TDs and fewer than three INTs over three games against one team. Note that Rodgers also led the Packers to a win over Cutler and the Bears in the NFC Championship Game after the 2010 season. Irony is after an offseason of debate about throwing at the goal line in their Super Bowl XLIX loss, the first play of the Seattle Seahawks’ season fittingly was a handoff to Marshawn Lynch. So was the last play … which got blown up on fourth-and-1 as the Rams defeated the Seahawks, 34-31 in overtime, on a 37-yard field goal by Greg Zuerlein. But it was Nick Foles, in his Rams debut, who completed a pass unlike any other in the team’s long NFL history. Foles found Lance Kendricks for a 37-yard touchdown with 53 seconds to play and Zuerlein’s extra point evened the score at 31-31. It was the first game-tying or go-ahead TD pass of 20 yards or longer in the final 60 seconds of the fourth quarter in Rams history. In other news – what were you thinking Pete Carroll with an onside kick in OT? Tyler Lockett opened the scoring in the Seahawks’ loss at St. Louis with a 57-yard punt return. Only three other rookies in NFL history scored on a first-quarter punt return in their team’s opening game of a season: George Atkinson of the Raiders (1968), Deion Sanders of the Falcons (1989), and Dale Carter of the Chiefs (1992). Philip Rivers completed 35 passes for 404 yards, including 15 to Keenan Allen, in the Chargers’ 33-28 come-from-behind victory over the Lions. Allen set a record for pass receptions in a season-opening game. The previous mark was 14, set by Andre Rison in 1994 and matched by Marshall Faulk in 2002. San Diego trailed Detroit, 21-3, in the second quarter. Only one other team in this century overcame a deficit that large to win its season-opening game, and Chargers fans should remember the other well. Two years ago, San Diego squandered a 28-7 lead in losing its opener to Houston, 31-28, on Monday Night Football. The optimists in Big D said the O-line was good enough to offset the loss of DeMarco Murray. But the Cowboys managed just 80 yards on the ground Sunday against a Giants defense that rarely stopped the run in 2014. Dallas only had less than 90 rushing yards once last year, when the Giants only held two opponents below 80. New York should’ve left Dallas with a W. But poor clock management — namely failing to milk it while opting to throw near the goal line on their final drive — provided Tony Romo with the opportunity to craft a successful comeback. Tony Romo threw an 11-yard touchdown pass to Jason Witten with 7 seconds to play and Dan Bailey added the extra point to give the Cowboys an unlikely 27-26 victory over the Giants. That was the latest game-winning fourth-quarter TD pass in Cowboys history. The previous mark was set in a 17-14 win over the Redskins in 1967 when Don Meredith connected with Dan Reeves for a 36-yard TD with 10 seconds to play. Dallas’ victory was unlikely in this sense: The Cowboys committed three turnovers and the Giants none. Over the past three seasons (2012-14), there were 100 regular-season games in which a team turned the ball over at least three times and had no takeaways; only three of those teams won. The Browns have now lost an NFL-record 11 straight openers, and Brandon Marshall might be the safety net the Jets need to stabilize their uneven passing game. He excelled in the red zone and bailed out Ryan Fitzpatrick by ripping the ball away from Browns safety Tashaun Gipson after an interception. With that, the Todd Bowles era started with a strong defensive performance as the Jets forced the Browns into five turnovers and posted a 31-10 victory. During six seasons under Rex Ryan, the Jets ranked 19th among the 32 NFL teams with an average of 1.5 takeaways per game. They had only one game with as many as five takeaways under Ryan, forcing six turnovers in a 38-7 win over Buffalo in 2011. The Colts were chic Super Bowl picks in many quarters, but didn’t look ready for the Bills, who shut Indianapolis out in the first half before winning 27-14. The Bills were sending seven defenders at Indianapolis Colts QB Andrew Luck on seemingly every passing down, especially early in the game. The all-out blitzes worked in Buffalo’s decisive upset. Making his first NFL start, the new Bills quarterback justified Rex Ryan’s faith in him by playing efficient, virtually mistake-free football. Taylor passed for 195 yards and a TD while adding 41 yards with his legs. Ground and pound, baby. The Colts’ struggles to stop the run have carried over to this season. The Bills ran 36 times for 147 yards and two touchdowns – leading a terrific start to Karlos Williams’ NFL career, as he gave the Bills a 16-0 lead on a 26-yard touchdown run on his first carry. It had been 20 years since any NFL player scored an opening-game TD of 20 yards or longer on the first carry of his career. The last player to do so was Michael Westbrook of the Redskins, with a 58-yard TD run in a 27-7 opening-day victory over the Cardinals. But guess what? A few hours later, Ameer Abdullah of the Lions did it as well, capping Detroit’s opening drive with a 24-yard TD run on his first carry. Kansas City Chiefs quarterback Alex Smith threw three touchdowns but none to a wide receiver – again. Smith’s last TD to a receiver was Dec. 8, 2013. On the other hand, Travis Kelce became the first Chiefs tight end to catch two touchdown passes in a game since Tony Gonzalez left Kansas City following the 2008 season. Gonzalez caught two or more TDs in a game 14 times for the Chiefs. passes for 104 yards and two touchdowns in the Bengals’ 33-13 win at Oakland. Eifert was the first Cincinnati TE with two TD receptions in a 100-yard game since Bob Trumpy scored three times in a 5-for-159 performance against the Houston Oilers in 1969. The Miami Dolphins are continuing a disturbing trend during coach Joe Philbin’s tenure with the team: They play down to lesser opponents. The offense came out flat in the first half at Washington, rushing for only 2 yards. But the most concerning questions from Miami’s victory were mental lapses on defense. For Washington, things were looking good for the home team early on Sunday. But then Ryan Tannehill found Rishard Matthews for a 3-yard TD late in the first half to narrow the Redskins’ lead to 10-7, and the Dolphins scored 10 points in the fourth quarter for a 17-10 victory. Washington was the first home team to lose its season opener after scoring the game’s first 10 points since 2002, when the Jets rallied from a 10-0 deficit for a 37-31 win at Buffalo. From the media-generated-controversy department – Why was CBS giving viewers constant reaction shots from RGIII — following many of Kirk Cousins’ throws? The Kelvin Benjamin-less offense produced just 263 yards and one touchdown – ouch. The supporting cast around Newton will likely add pressure on Carolina’s defense, especially if MLB Luke Kuechly’s concussion proves severe. In other news, Josh Norman intercepted Blake Bortles and returned it 30 yards for a touchdown in the Panthers’ 20-9 win over the Jaguars. That was a problem for Bortles as a rookie last season, when he tied for the NFL lead by throwing four pick-6’s, which was also a single-season team record.